Protests erupted in Chicago Tuesday night, following the release of video footage from the October 20, 2014 police killing of Laquan McDonald by 14-year veteran cop Jason Van Dyke. Several hundred people demonstrated late into the night, and at least three arrests were made. The release of the video shatters a year-long attempted cover-up by the Chicago Police Department and the administration of Democratic Party Mayor Rahm Emanuel, the former chief of staff for President Barack Obama. The city worked systematically to prevent the video from being made public, while lying about the circumstances behind the murder of McDonald. Earlier on Tuesday, Illinois state prosecutors charged Van Dyke with murder in the first degree for the shooting, which occurred “without legal justification and with the intent to kill or do great bodily harm,” according to a one-page court filing. 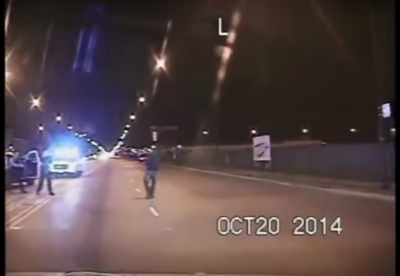 The release of the video and the decision to charge Van Dyke comes nearly a week after Cook County Judge Franklin Valderrama ordered city officials to make public the footage. Charges against Van Dyke were sped up in an effort to assuage public outrage and social unrest that city officials anticipated would follow the forced release of evidence of wanton murder. The video, which comes from a police cruiser’s dashboard camera, shows McDonald walking in the center lane of a busy thoroughfare. Van Dyke gets out of his car and, unprovoked, fires 16 bullets into the teen, who is walking away from the officers. Gun smoke visibly emanates from McDonald’s body as he is repeatedly shot while lying on the ground. Autopsy reports show that McDonald was shot twice in the back, while 9 of the 16 bullet wounds he received had a downward trajectory. Van Dyke, who had been placed on desk duty pending investigations by the FBI, the US attorney’s office in Chicago and the state attorney’s office for Cook County, turned himself in Tuesday. He is being held without bail. While Emanuel is now claiming that he supports the video’s release—a transparent attempt to deflect attention from his own culpability in the cover-up—the city and Chicago Police Department in fact desperately attempted to prevent public exposure of the crime. In April, the city awarded a nearly $5 million settlement to the family of McDonald in a wrongful death lawsuit, which included a provision that the video would be kept secret. The judicial order requiring the video’s release, exposing these lies, came only after an independent journalist sued the police department following an initial decision not to grant his Freedom of Information request. Even the existence of the video came to light only thanks to the actions of a whistleblower. “The real issue here is, this terrible thing happened, how did our governmental institutions respond?” Jason Kalven, the reporter who first uncovered the story, told the Chicago Reporter. Van Dyke was not an unknown quantity. Eighteen complaints had been filed against the cop throughout his 14 year career in the Chicago Police Department, including for the use of excessive force and shouting racial slurs at individuals whom he had detained. Yet he remained on active duty. The charging of Van Dyke after a coordinated campaign of cover-up and lies only exposes the fact that the vast majority of police murders go unpunished. The entire political establishment, from the Obama administration on down, works systematically to exonerate killer cops. Only in extraordinary circumstances—when video unambiguously shows criminal activity—are charges filed, and often these result in exoneration. Indeed, it is exactly one year since St. Louis prosecutors announced that they would not press charges against Ferguson, Missouri police officer Darren Wilson for the murder of unarmed teenager Michael Brown. Since then, more than 1,000 people have been killed by police in the United States. A Washington Post report earlier this year found that only 54 police officers have been charged over the past decade, leading to only 11 convictions. Significantly, it was in Chicago that the Obama administration’s FBI director, James Comey, last month criticized the prevalence of video showing police killings for creating a “chill wind blowing through American law enforcement over the last year.” In other words, the problem is not that cops are murdering unarmed individuals, but that these murders are being documented and exposed.